Marvin Windows vs Pella Windows: Which One is Better? That is a great question. If you are in the research phase of your window buying journey, you have probably heard of both brand name window companies. Both of these companies are large corporations whom have been in window manufacturing for a long time and have prominent names in the fenestration industry. The question of “Which is Better” does not have a black or white answer. It has a gray answer. In other words, “It depends.” It depends on you and what your needs are, what your wants are and what you are trying to achieve with your new windows. Let’s begin with an overview of what is available from both companies because both companies have more than one line of window types, meaning the windows are made from different materials. Marvin has essentially three prominent lines, their Ultimate Collection, which can be an all-wood product or an aluminum clad exterior, wood interior product. Their other two lines are both fiberglass windows. The Integrity from Marvin is available as an all-fiberglass product both inside and out, or with a Fiberglass exterior and a wood interior. The Infinity by Marvin has a Fiberglass exterior and a faux wood interior. On the other hand, Pella has a slew of different window lines from vinyl replacement windows to aluminum clad windows with blinds between the glass (Designer Series). But the four most popular lines are the Pella Impervia (their fiberglass window), the 450 Series (more commonly known as Pella Proline), the Designer Series and the Architect Series. Being that Marvin does not have a vinyl window option, we cannot do a comparison between the two. For a more detailed discussion about both company’s fiberglass window options, check out the blog, Marvin’s Fiberglass windows vs. Pella Impervia: Which Fiberglass Window is Better? If you are interested in a comparison between the two Marvin Fiberglass options, check out the blog, Integrity by Marvin vs. Infinity by Marvin: Which is Better? 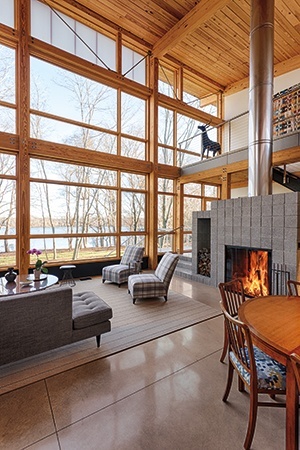 So in this blog, we are going to focus on comparing the wood clad window lines. As mentioned above, Marvin has one Aluminum Clad Window Line, the Ultimate Collection. Within this collection are different selections and options such as the Contemporary Line. However, all windows are built the same. On the other hand, Pella has the three separate clad wood lines, all built slightly differently. 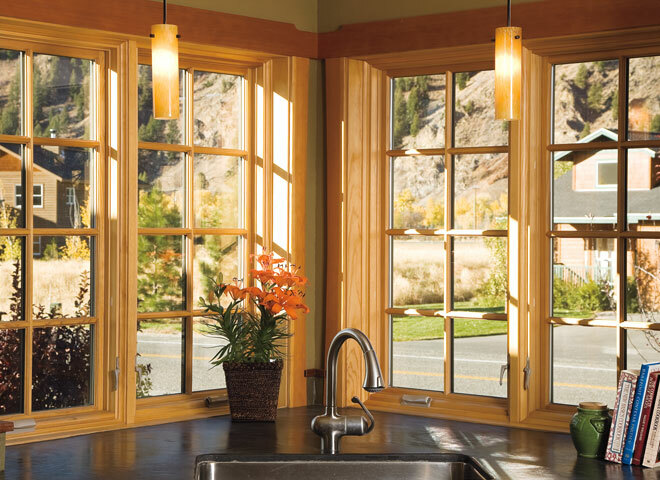 The Marvin Ultimate Collection wood-clad window has an extruded aluminum exterior (both sash and frame) and a wood interior. Clear pine is the standard option for the wood interior, however, you can get other wood species such as Fir, Oak, Mahogany, Cherry, etc. as an upgrade. Unlike Marvin, Pella offers a more cost effective, entry level wood clad option. This is the Pella 450 series (Pella Proline). This window has a roll form aluminum cladded exterior and a wood interior. Clear Pine is the only wood species option available in this line. built slightly different than the 450 Series in that it has an extruded aluminum frame with a roll form aluminum cladded sash. A Pine interior is also standard for this line but many wood species are available as upgrades. The Pella Designer Series also has an extruded frame and roll form aluminum cladded sash, but it comes standard with triple pane glass with a “blinds between the glass” panel. If you are unfamiliar with the difference between extruded aluminum and roll form aluminum, check out the blog, Aluminum Clad Windows and the Differences. Both Marvin and Pella have numerous options and selections for their window lines, far too numerous to list in this blog! So my best advice for those specific selections, such as hardware finishes, to exterior cladding colors, is to visit each manufacturer’s website. Fortunately, they make it really easy to remember! For Marvin, visit Marvin.com. For Pella, visit Pella.com. Being that both Marvin and Pella have many options and selections available to customize your windows to meet your own personal needs and wants, we need to look at the way they are built and specifics such as warranties to really make a comparison. Here is an easy to follow graph to help you better compare the Wood Clad Window options from both Marvin and Pella. As you can see, trying to say that one window line is better than the other is almost impossible. Both Marvin and Pella have details, options and selections to meet different people’s needs. If you are getting ready to sell your home in the next five years, the Pella 450 series is a great option. Pella is well known, so the name brand is great for resale value and your upfront costs will be lower. If this is your “forever home,” then opting for the Marvin Ultimate and paying a little more upfront, but knowing your investment is well protected, might be the perfect option for you. As you continue your window search, really consider what features, aspects and benefits are most important to you. That is how you will decide which window is “better”!